Ipomopsis longiflora. 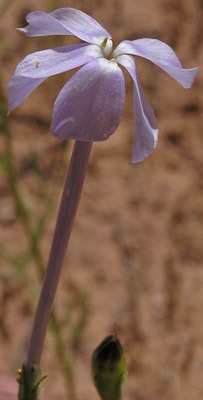 Synonym: Gilia longiflora. 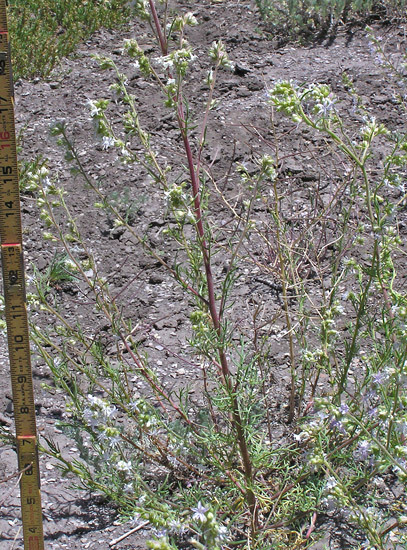 (Long-flowered Skyrocket). Semi-desert. Shrublands, openings. Spring, summer. Canyons of the Ancients National Monument, June 6, 2005 and Comb Wash, Utah, October 28, 2013. Ipomopsis longiflora is hard to spot because its stems, leaves, and flowers are so very slender, because its flowers are very light colored, and because it is relatively uncommon, far less common than the almost ubiquitous Ipomopsis aggregata. 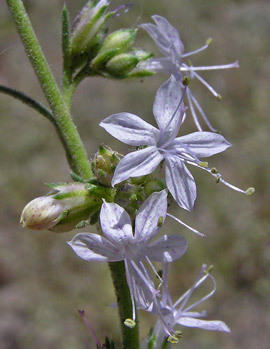 Leaves are similar to those of Ipomopsis aggregata but basal leaves are wilted by anthesis (flowering time), and flowers are far fewer. 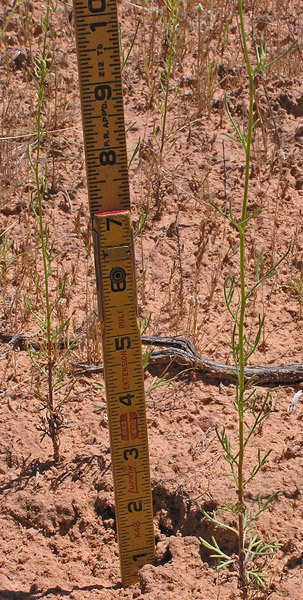 Ipomopsis longiflora prefers open, sandy soils at lower elevations. 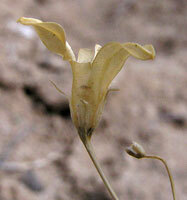 The plant was first collected by Edwin James in the 1820s and was named Cantua longiflora by John Torrey in 1827. 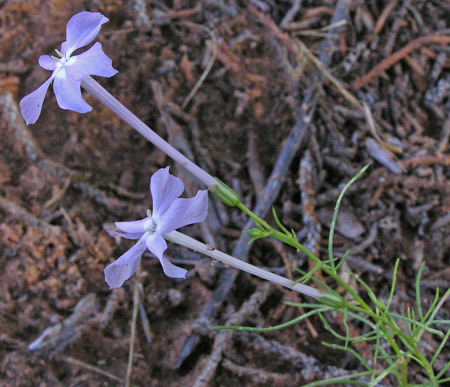 Georg Don renamed it Gilia longiflora in 1837 and 20th century Gilia expert, Verne Grant, renamed it Ipomopsis longiflora in 1956. "Ipomopsis" means "similar to Ipomoea", Morning Glories, one of which has a tubular red flower. Squaw Creek Trail, Canyonlands National Park, Utah, September 10, 2005. Flowers range from light blue/lavender to white and from one to almost three inches long. 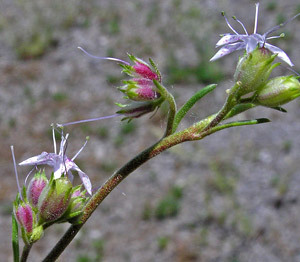 The flowers pictured are nearly three inches long. Bisti/De-Na-Zin Wilderness Area, New Mexico, March 27, 2006. Delicate beauty exists even in the winter's dried involucre. In the center of the picture above, the involucre is green with light lines through it. Pagosa Springs, June 25, 2007. Ipomopsis polyantha is a showy plant that often spreads over large areas in dense stands of plants, sometimes numbering in the thousands. 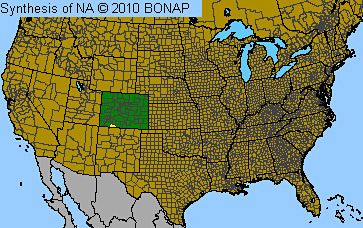 It is commonly on disturbed Mancos Shale in its only home, Pagosa Springs, Colorado. Plants have many flowers, a raggedy appearance from a distance, and a peculiarly strong smell. 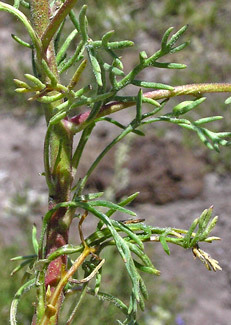 Leaves have characteristics of a number of members of the Ipomopsis genus: they are hairy and cut into fine, linear segments. 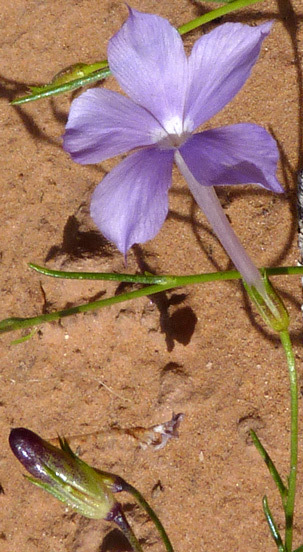 Ipomopsis polyantha is a rare and threatened plant. Click to read "Ipomopsis polyantha: A Technical Conservation Assessment". Ipomopsis polyantha was discovered in 1899 by Charles Fuller Baker. 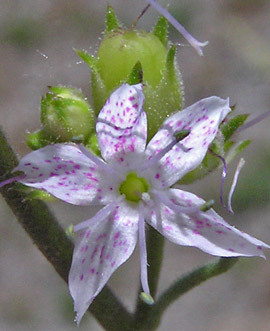 In 1904 Per Axel Rydberg described this plant and named it Gilia polyantha. Twentieth century Polemoniaceae expert Verne Grant renamed the plant Ipomopsis polyantha.